Studio Artifacts is an interview series, which invites artists to select, examine, and discuss some of the significant items they keep in their studios and gives readers an intimate glimpse into their practice. 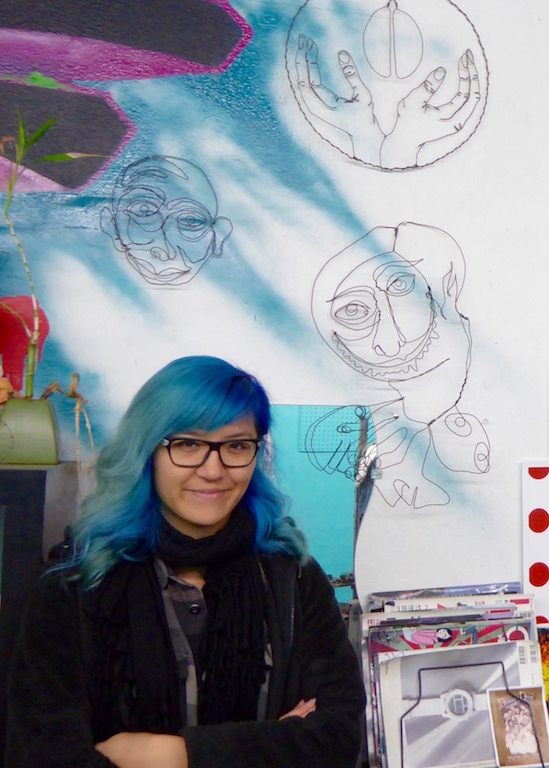 Diana Dich is a Sacramento-based artist who creates wire sculptures and drawings. Her recent sculptures explore her personal experiences with mental illness and her relationship to her cultural background. TUBE. : Would you like to start by discussing your wire drawing of a face? Diana Dich: The first time I found wire was in my high school art class. My teacher handed everyone a spool of wire but didn’t teach us how to use it. He just told us to go for it. In class, I made a three-dimensional sculpture of a man flying his son as a kite, and it (using the wire) just really stuck with me. This wire face was the first sculpture I made outside of art class. I made it when I was about fifteen or sixteen years old. It was the first sculpture I made just using a single strand of wire. It’s actually how I started using wire as a medium. It looks and feels more abstract than the sculptures I make now. Sometimes I feel like my current pieces are too realistic and polished. I like how messy it looks. Art by Diana Dich. Photo Justina Martino. T: Did you continue making wire sculptures after that class ended? D: I did. I just kept making a bunch of wire faces. When I was sixteen or seventeen, I had a MySpace account, which was full of images of the sculptures I made then. I made a lot of portraits and silly cartoon characters. T: Did you make mostly female faces then? D: Actually, I sculpted pretty much all male faces in high school. I started sculpting female faces last year, which was also around the first time I stepped out as an artist. I never called myself an artist before then. I still feel awkward calling myself an artist but I realize that it’s what I need to do. Dich’s locket. Photo: Justina Martino. T: Do you want to talk about the necklace? D: The necklace was a gift from my mom. It has my name in Chinese and my sign, which is a ram. I usually don’t care about jewelry but it’s a nice reminder of where I came from. T: Do you remember how old you were when your mom gave it to you? D: I was probably around eight years old. It’s really old. You can see where there used to be details that are now worn down. I used to wear it every day. It’s a nice reminder of my family and culture. The Sacramento art scene is completely different from what I grew up with. This necklace is something that grounds me. T: How do you feel when you wear it? D: It makes me feel safe because it reminds me of my family, specifically my mom. It was just something that I got so accustomed to wearing. I wore it every single day until I had to take it off to perform in a high school play. It’s funny because I felt like I lost my own identity and culture in high school. I love Southeast Asian food and lots of other things related to my Asian culture but during high school, I just forgot it all. I kind of just became like the people around me. T: Did you recently rediscover this necklace or have you always had it put away somewhere safe? D: I’ve had it put away. Sometimes I look at it and I feel really guilty for not wearing it. I often struggle with the decision to make art, which reflects my culture and my personal cultural experience. Every time I look at the necklace, it reminds me of myself and my culture and how I should try to reflect some of it in my work. Note from Dich’s boyfriend. Photo: Justina Martino. T: Do you want to talk about the note? D: This is a note from my boyfriend from a few months ago that says, “I love you, Diana. Are you okay?” I have clinical depression and every once in a while I have anxiety attacks. I had locked myself in my room like I usually do when I have a bad anxiety attack. And this note was his way of checking on me. With past familial or romantic relationships, I never really had somebody who cared for me in this way. So this note is a nice reminder that somebody actually cares about my wellbeing. It also relates to the culture I grew up in. In my Asian family, we never really talked about mental illness or personal struggles. Up until I was about seven years old, I tried to run away a lot. I would get all the way to the Main Street but I didn’t know how to use the crosswalk button. I never got too far. Recently, I’ve also been addressing my depression in my art. T: Do you keep this note with you? D: Yes! But, my boyfriend doesn’t know I keep it. I keep it with me all the time. Words and photographs by Justina Martino. Tags: anxiety attacks, Art, Artist, culture, depression, Diana Dich, family, interview, Justina Martino, love, mental illness, Southeast Asian, Studio Artifacts, TUBE. Magazine, wire art. Bookmark the permalink. Previous post ← Look Inside Woman’s March.